The Bossy Edition: Peel Your Eggplant! Make This Salad! Cook These Recipes! In an effort to keep this blog from being dominated by cooking, this is a three-part post, full of bossiness. If you follow all of my instructions, your life will be transformed. Seriously, it will be. I heard this instruction on Food and Wine (a local radio cooking show). To be honest, that show is so often pretentious and ridiculous, I almost wrote it off. As in, the chef said (in a of course everyone knows this voice), “Oh of course, never put eggplant skin in ratatouille.” But then, a few weeks ago, I made ratatouille and decided, why not try it? So I used a vegetable peeler to take off the skin before chopping up the eggplant (super easy) and it was the best ratatouille. I’d ever made. Then last week, I made this super delicious barley salad with roasted eggplant. Again, I peeled the eggplant before chopping and the roasted eggplant was so amazingly delicious, I had to stop myself from eating all of it before dinner. As it turns out, it’s not that I don’t like eggplant. It’s that I don’t like eggplant skin. That’s why I love melitzanosalata so much. Repeat after me: I promise to always peel my eggplant before cooking it. 2. 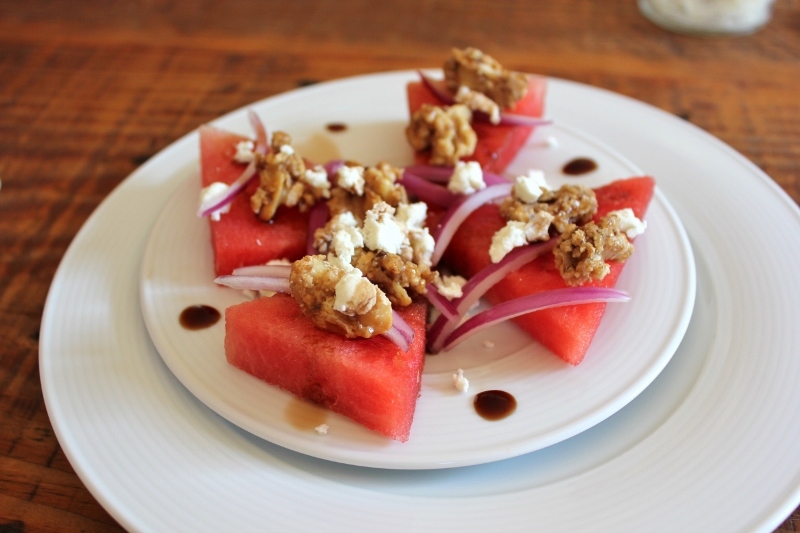 Make this salad before watermelons go out of season! This is fancy schmancy – usually we just put it all in a bowl and chow down! Arrange on a plate or in individual bowls and drizzle with balsamic vinegar. Make sure you have all parts in each bite. Wish that watermelons are in season year-round. Dream of next summer’s watermelon.